We have been teaching Spanish as a foreign language since 1986. Our Spanish school is located in Granada, one of the most fascinating cities in Andalusia, southern Spain. The Spanish courses are held throughout the year. The friendly atmosphere and personal touch of our classes as well as Granada's Andalusian charm will turn your language holidays into an unforgettable experience. The school building, characterised by its Andalusian style, its friendly classrooms, and its beautiful courtyard, retains much of the charm and intimacy of a family home. It is situated in a quiet location just ten minutes away from the city centre. Students from all over the world and from different age groups participate in our language programme throughout the year. An extensive and daily cultural programme always complement the courses. 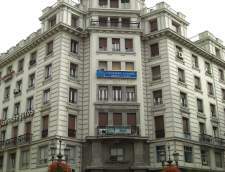 We are accredited by the Spanish Instituto Cervantes since 2002 and a DELE Examination center. With 1000 students every year we can be considered as a medium-sized Spanish language school. Our school is a member of Tandem International with a network of language schools in Europe and overseas. Siamo una scuola che si trova nel centro di Granada e ti proponiamo molto di piu' di semplici corsi di Spagnolo. Vieni a imparare lo spagnolo in Spagna e fallo insieme a noi! Granada è la città dell' Alhambra, l'eredità piú grande della dominazione araba. L'influenza araba si nota ad esempio lungo le tortuose stradine ciottolate. Anche i dintorni di Granada hanno molto da offrire: la stazione sciistica della Sierra Nevada, la Costa Tropicale, le montagne dell' Alpujarras, Cordoba, Siviglia etc sono solo alcuni esempi di luoghi magici, a prossimità di Granada. Grazie alla posizione ideale di Delengua, ci troviamo a soli 5 minuti dall'Alhambra e dai giardini del Generalife! Nel quartiere di Delengua, verrai catturato da una vibrante ed accesa vita notturna: vari pub, bar, discoteche e taverne. Assapora le tapas -uno snack spagnolo - che ti verrà servito gratuitamente insieme alla tua bevanda. Insomma, non ti sembra il luogo perfetto per imparare lo spagnolo? Escuela Delengua si trova in un edificio completamente ristrutturato , con cortile interno, terrazza e le piu' moderne comodità. Sfrutta la connessione ad internet gratuita nel nostro laboratorio di informatica o la wi-fi per il tuo portatile! Inoltre potrai usufruire della nostra biblioteca con numerosi libri, film e musica spagnola. Offriamo corsi di Spagnolo di alta qualità. Siamo riconosciuti dal CSN Svedese. Inoltre abbiamo creato una Garanzia Soddisfatti o Rimborsati. I nostri professori sono giovani di madrelingua spagnola laureati in filologia, con esperienza, ma soprattutto passionati per l'insegnamento. Il numero di alunni varia da un minimo di 2 ad un massimo di 8. In questo modo si crea una stretta relazione tra l'insegnante e lo studente, quello che permette a quest'ultimo di essere seguito passo a passo durante tutto il corso. Learn Spanish & live in your private teacher's home around Granada with Home Language International! Home Language International (HLI) is a family-run business offering language courses in more than 20 languages in over 30 countries worldwide, including Spanish lessons at an experienced private teacher's home in Spain. More than 5,000 students take advantage of our services every year. Ian Josephs, Danielle Josephs, their 5 adult children and an expert team of dedicated staff all put in very long hours for HLI. 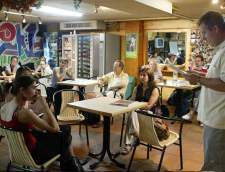 You stay in an experienced teacher's family home, have one-to-one Spanish lessons and then continue to use the language during the rest of your stay in Granada. Because you are the only student, you are guaranteed individual attention. The lessons are completely designed for you, so the teacher will focus exactly on what you need. Mealtime conversation, television and social contacts are all in Spanish. All of our teachers in Spain have a university degree (or equivalent) and/or a recognised teaching certificate. All teachers have been visited by one of our local organisers. Their qualifications have been checked and their homes throughly inspected. During your stay in Granada, a local organiser will monitor your progress and make sure your experience is both happy and successful. Home Language International (HLI) is accredited by the Accreditation Body for Language Services (ABLS), Association of Language Travel Organisations (ALTO), and UNOSEL. A don Quijote Granada egy egész ötemeletes épületet elfoglal. Az iskola világos és szellős, sok ablakkal és erkéllyel, amik az utcára néznek. A hangulat bensőséges és nyugodt. Az épület központi fűtéssel és légkondiciánlóval is fel van szerelve – Granadában mindkettő elengedhetetlen, hisz a különbség a nyári és a téli hőmérséklet között igen extrém. A többi don Quijote iskolához hasonlóan, a don Quijote Granda is modern tanítási eszközökkel van felszerelve, úgy mint számítógépek és audiovizuális berendezések. A pihenő helyiség az alsó szinten található. Itt nézhetsz TV-t vagy DVD-t, zenét hallgathatsz, könyvet vagy újságot olvashatsz, vagy esetleg dartsozhatsz, társasjátékozhatsz, stb. Az iskola a városközpont egy csendes és biztonságos környékén található, a c/ Azhuma 5 alatt, csupán egy kőhajításnyira a katedrálistól, és közel van az Alhambra, az Albaicín és a Konferencia Központ is. A buszmegállók sincsenek az iskolától messze, és minden órában indul buszjárat Sierra Nevada és a Földközi tenger partjára is. Learn Spanish in front of the Alhambra. 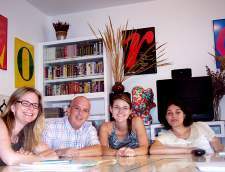 With 30 years of experience, CELEI, a center approved by Instituto Cervantes, is a small Spanish language school with a close-knit, family atmosphere. Our school, situated in a typical house with garden and Arab wall, is located in the heart of el Albayzín, the historical neighborhood declared a UNESCO World Heritage Site. CELEI offers an unbeatable location in front of the Alhambra and el Sacromonte, a genuine Gypsy neighborhood that will make you feel and experience up-close the art of flamenco. With a focus on Learning by Experience, CELEI offers Spanish courses and Study Abroad programs for smaller groups, where the student is the protagonist in his or her own learning process. Through our courses, cultural activities, field and volunteer work, our students are able to immerse themselves in the Spanish language, culture and society in a natural way. If you want to feel yourself at home, enjoy our lounge with fireplace, connect to the Internet from our garden, enjoy our library and projection room, do not hesitate to come to CELEI for an unforgettable experience en Granada. Castila is located in a traditional house in the beautiful Albaycin, with views of the Alhambra. We offer many different Spanish courses including intensive courses, DELE preparation, business Spanish, refreshers for Spanish teachers, etc. The language courses in CastiLa are interactive, class sizes are deliberately kept small (maximum six per class) and participation in the college social programme enthusiastically encouraged. After classes, some food, and maybe a siesta, professors and students meet to enjoy tapas or indulge in whatever activity going on that day to enjoy Spanish culture and put the Spanish learnt to good use.In Castila you will find professors and students from all walks of life and from all over the world, forming friendships and experiencing life in Spain together. All our teachers are native Spanish speakers with two basic requirements: they have the highest university qualifications and they have specific training in teaching Spanish as a second language. They are, without a doubt, the most valuable part of CastiLa. Since 1995 LINGUASCHOOLS GRANADA- SHM is a language school specialising in the teaching of Spanish and English as a foreign language. We make the difference, guaranteeing consistency, good service, professionalism and being held responsible for all of this. Our objective is to promote both the Spanish language and culture to our students. We offer a variety of Spanish Language and Culture Courses, Combined Activity and Sports and Teacher Training Courses (teaching Spanish as a foreign language). We offer programmes for schools and young student groups providing tailored courses to compliment and meet the objectives of students and visiting teachers alike. We have links with numerous educational establishments in Norway, Austria, Germany, France, UK and USA. Our school is situated in the heart of Granada city, within minutes of all city centre facilities. Our students enjoy a great school location, good quality accommodation, an lively and friendly atmosphere and excellent courses and well prepared cultural and social activities. Proyecto Español is a language school, that specializes in Spanish for foreigners, with academies across Spain. 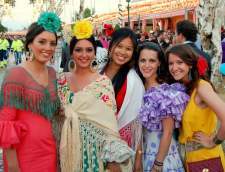 Their goal is to teach the Spanish language and culture and to provide great experiences at reasonable prices. Proyecto Español Granada is an excellent school located in the heart of one of the most beautiful monumental cities in Spain. It is home to the most visited monument in Spain, the "Palace of the Alhambra". While studying in Granada students are encouraged to partake in activities that get them out into the city and conversing in the local dialect to help them better master the nuances of the Spanish language. 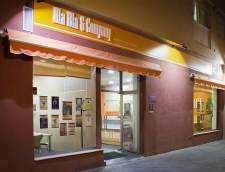 Centro de Integracion y Comunicacion de Almunecar S.L. Bla Bla Company is backed by an 18-year experience. During this time, we have offered Spanish courses of many kinds and levels, such as private courses, continued training for foreign workers as well as courses for companies and students. We have had students from different countries, like Portugal, Great Britain, China, France, Russia, Poland, Czech Republic, Morocco, Austria, United States, Italy, Germany, Sweden, Egypt, Japan and many more. Bla Bla Company is an authorised centre for preparing and testing SIELE (authorisation number 18904). Ön akár diák, üzletember vagy utazó Granadaban van az Ön számára megfelelő nyelvtanfolyam. Minden szint és korosztály számára elérhetőek a nyelvtanfolyamok, bármilyen időtartamban. Csak válasszon egy nyelvtanfolyamtípust a lenti listából és fogjon hozzá.